Sous Vide on the cheap! Sous-vide is a gourmet cooking technique that, up until recently, has only been available to those who frequent only the poshest of restaurants. Somewhat recently, consumer priced restaurant quality sous-vide systems hit the market opening up this technique to a much broader audience. I think that Nathan at The Modernist Cuisine said it best in Why Cook Sous Vide? Such mastery over heat pays off in several important ways, most notably, freeing the cook from the tyranny of the clock. Traditional cooking with a range, oven, or grill uses high and fluctuating temperatures, so you must time the cooking exactly; there is little margin for error. With just a moments inattention, conventional cooking can quickly overshoot perfection. Getting started with sous-vide certainly can be done for less than $250 - $500 if you're willing to build it yourself. It's super easy to do and if you start from scratch can be as cheap as 35 bucks. The technology to precisely control the temperature of the water bath is based on something called a PID Controller (proportional-integral-derivative controller). In short, this contraption learns how applying power to your heater changes the temperature of the bath and can thus control the temperature accurately within just a few degrees. I picked up the STC-1000 for about $15 on Amazon. My first foray into sous-vide myself was with a slow cooker. I used the PID to control power to the slow cooker which I left on high to heat the water. There is a trick to this, however. Many slow cookers now-a-days offer automatic shutoff and programmable cooking modes. These cookers will be angered by the frequent power cycles from the controller. I've found that the magic word in getting a slow cooker that'll work with your sous-vide controller is manual. I also like cheap :). I expect that most of the Manual Slow Cookers on Amazon will work for this application. To get the most even heating and best control of the water temperature, I've found it's best to encourage circulation of the water in the system. In my construction, I used a small 80 GPH Aquarium Pump I got for about $8. It suctions right to the side of my slow cooker and it seems to distribute the heat very evenly. In the construction section, I'll describe how I conveniently power it and the slow cooker at the same time. Building your sous-vide controller is actually pretty simple. 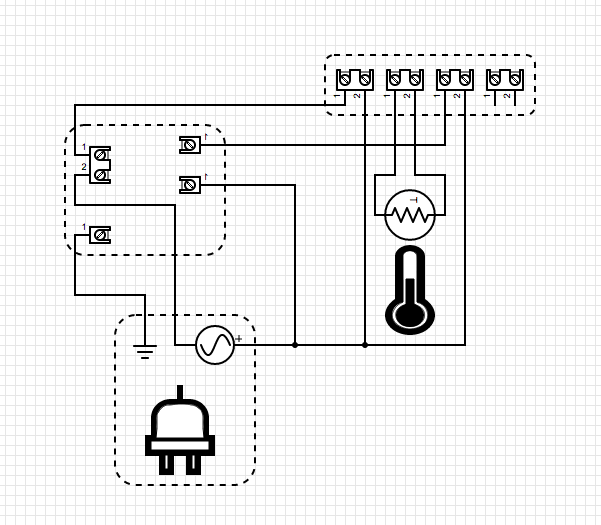 The PID controller does most of the hard work; you just need to get things wired together. For my construction, I purchased a three-prong replacement cord (one that's already stripped at the end). I'm going to put together a new one with a few enhancements I'll mention later. The temperature probe and the power cable are the only things sticking out of my controller (which happens to be an old food storage container I cut holes in with my Dremmel). 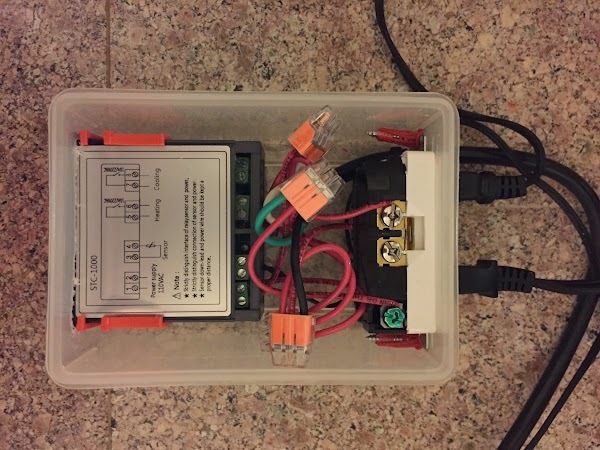 I realized after putting it together that I could have used one of the many computer cables I have lying around the house if I got a IEC C14 Socket and it's cheaper! I also don't like that my temperature probe hangs out of the container in storage. It'd be pretty neat if I could wrap it up and stick it inside the box. I'm going to remake my container and add a Speaker Terminal. Also, it would've been a whole lot easier to keep track of my wiring had I bought red, black, green, and white wire. You may need to pick these up if you don't have them on hand. I started by making sure I hadn't plugged the power in yet. Probably goes without saying; I just like to be cautious. Measure spots for your attachments on your project box. You'll want one for the outlet and one for the PID. You may also want one for the various other ports, switches, etc. that you decide to add. I wanted to have one outlet that's always on to power the pump and one outlet that switches on and off for heat. A lot of folks have a cooling requirement too for homebrewing so keep that in mind when you're purposing your outlets, but I don't homebrew (yet) so the always on / heater outlet pair was just right for me. In any case, to support this, I broke off the metal strip that attaches the two positive leads on the outlet. I left the negative leads connected. I also went ahead and attached my wires knowing how much effort it would be to wire once I stuck it in the container. There will be 5 leads. Attach 1 wire to each one. Add the other components to the box.